Gallery Nosco is proud to announce The Good, The Bad and The Ugly, presented by leading International artists, Alexandros Vasmoulakis and Dran with new work by flourishing British contemporary sculpturess Naomi Doran. The colossal romantic murals of Greek artist Alexandros Vasmoulakis adorn his home city of Athens decorating the extremities of his city. The ever shifting and evolving work ricochets from the poetically handsome to the hideous; his work is character based and his fictional creations explore the fierce prime human emotions; Love, Desire, Seduction and Hate. Vasmoulakis employs collage, painting, photography and digital media throughout his work. 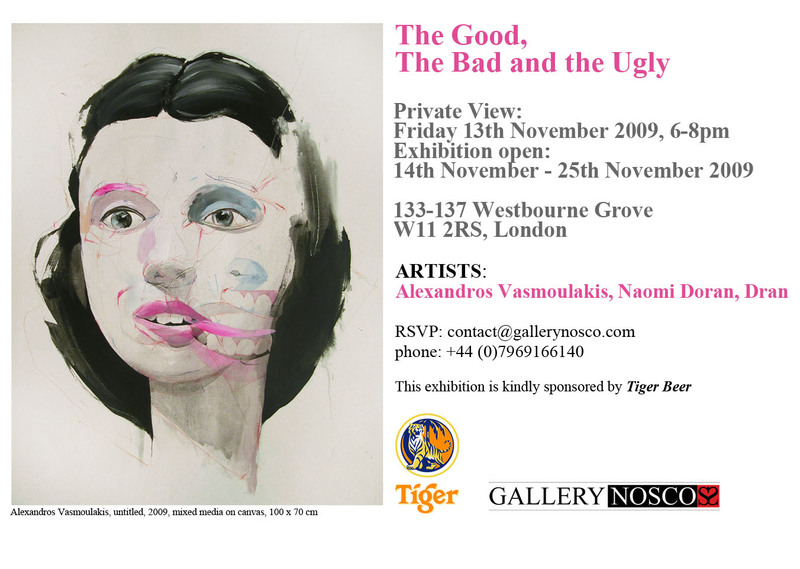 The Good The Bad and The Ugly will host the release of a limited edition print by Alexandros Vasmoulakis. The print will be available for purchase from the night of the private view for the duration of the exhibition only and subsequently online from Gallery Nosco’s new site. French graffiti maverick Dran’s darkly satirical and ironical works repeatedly address the moral decline in today’s modern society. Although the artist works in many mediums including taxidermy sculptural installations and drawing, he presents us again with his viewpoint in this exhibition with large canvases, built up with layers of oils, pastels and spray-paint. The artist has recently been cited on numerous occasions as “one to watch” and has had sell-out solo shows across France, featured in numerous group shows across London and Paris; and has upcoming exhibitions in US. Contemporary newcomer Naomi Doran’s industrial sculptural paintings incorporate raw solidified liquid concrete, entwined with corroded metal which are set in wood. The concrete is ceaselessly transforming and the hairline fractures in the concrete are interminably widening, elongating and responding to the shifting rhythms. The artist had her first solo show in East London and took part in a group exhibition in Mayfair, The Summer Exhibition, as well as featuring in the Harrods Al Fayed Lawnfest Charity Auction in June. She has upcoming exhibitions in France and US. The artist currently lives and works in Dalston, London.